When a serial killer breaks into the home of bestselling author, Sage Quintano, she barely escapes with her life. 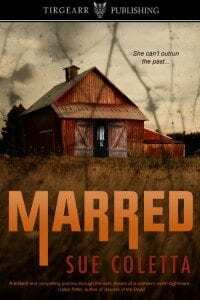 Her husband, Niko, a homicide detective, insists they move to rural New Hampshire, where he accepts a position as Grafton County Sheriff. Sage buries secrets from that night—secrets she swears to take to her deathbed. Three years of anguish and painful memories pass, and a grisly murder case lands on Niko’s desk. A strange caller torments Sage—she can’t outrun the past. Um, Troy, Shouldn’t the title of this post be Marred instead of Murder?